V.E. Zuev Institute of Atmospheric Optics of Siberian Branch of the Russian Academy of Science (IAO SB RAS) , the first academic institute in Tomsk, was founded in 1969 from the Laboratory of Infrared Radiations of the Siberian Physical-Technical Institute of the Tomsk State University. The Institute was founded by Academician Vladimir Evseevich Zuev (1925–2003), Hero of Socialist Labor, winner of the State Prize of the USSR and the Prize of the Soviet of Ministers of the USSR, winner of 22 governmental awards, director of the Institute for 28 years. 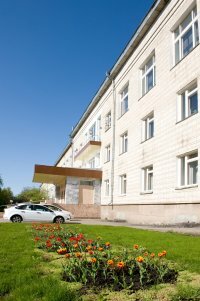 The scientific school in atmospheric optics formed at the Institute is now generally recognized and well-known both in Russia and abroad. The primary objective of the Institute is to perform basic research in the field of atmospheric optics, as well as to design and fabricate new devices, software and databases for this research. Institute of Atmospheric Optics has unique monitoring stations (Siberian lidar station, TOR station, aerosol station) for long-term systematic monitoring of atmospheric parameters and regularly organizes research missions to different regions of Russia and the world in order to conduct field measurements and reveal regularities in the behavior of atmospheric parameters. The Institute is open for any kind of cooperation in carrying out joint investigations and using the long-term records of atmospheric data, as well as in development and operation of equipment. The Institute invites undergraduate and postgraduate students to get their first experience in scientific research. The Institute publishes the bilingual (Russian and English) scientific journal Atmospheric and Oceanic Optics and holds several scientific conferences. Institute of Monitoring of Climatic and Ecological Systems. The issue No 4/2019 of Optika Atmosfery i Okeana is published. The issue No 3/2019 of Optika Atmosfery i Okeana is published.